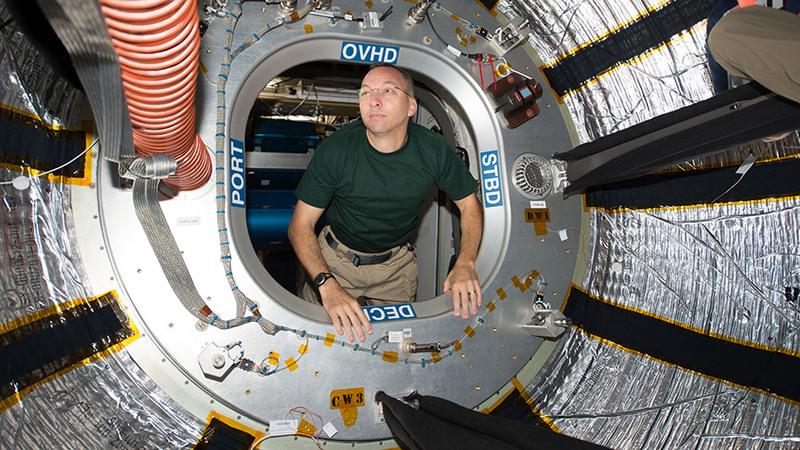 Astronaut Randy Bresnik enters the Bigelow Expandable Aerospace Module in July 31, 2017, when he was a Flight Engineer for Expedition 52. More CubeSats were ejected from the International Space Station today to demonstrate and validate new technologies. Back inside the orbital lab, the Expedition 53 crew continued outfitting an experimental module and studying life science. Two more tiny satellites were deployed from the Kibo laboratory module into Earth orbit today to research a variety of new technologies and space weather. One of the nanosatellites, known as TechEdSat, seeks to develop and demonstrate spacecraft and payload deorbit techniques. The OSIRIS-3U CubeSat will measure the Earth’s ionosphere in coordination with the Arecibo Observatory in Puerto Rico. Commander Randy Bresnik was back inside the Bigelow Expandable Activity Module (BEAM) today with Flight Engineers Paolo Nespoli and Joe Acaba. The astronauts are converting the experimental habitat into a cargo platform by replacing old BEAM hardware with new electronics and stowage gear. Eye exams are on the schedule this week as two cosmonauts and two astronauts took turns playing eye doctor and patient today. Alex Misurkin and Sergey Ryazanskiy of Roscosmos started first with the optical coherence tomography hardware using a laptop computer. Next, Nespoli and NASA astronaut Mark Vande Hei took their turn to help doctors on the ground understand the vision changes that take place in space. The Desertification represents the main reason beyond The Poverty in The World, therefore fighting The Desertification should always take The Priority in any Global Programs of Eradicate The Poverty, but in order to Eradicate The Poverty we need to find a suitable Agricultural Projects for those Communities which suffers of Desertification, but unfortunately many Developing Countries are unable economically to pay for The Required Projects of fighting The Desertification, therefore a New and Active Organizations should be found in the United Nations, works separately of FAO activities, able to Protect World’s Rivers via finding a Global laws of Protection Rivers and water shares and able to fight The Desertification Successfully, particularly in a Developing Countries, either finding a Modern Agricultural projects or even provide the Recent Technology of using water for the agricultural purposes, because those conflicts among some of Developing Countries around the world, is due to The Desertification and Poverty before it takes a Politics Shape and Symbols, in the meanwhile The Desertification is a Global Challenge and its Consequences effects Globally for a long term, either directly or indirectly therefore it should be treated Globally and Actively, also to help those communities to Stand Strongly depending upon their Natural Resources to live normally with a dignity and far of the humanitarian aid. When a Huge Dams been built for a Tremendous Financial Benefits for Specific Countries and The Drinking water represent as a Weapon in Conflicts, The Modern World should deal with that challenge firmly, before those Crises and Conflicts grows to costs Trillions Dollars Weapons, Victims, Demolished cities, Army of Refuegies, Tremendous Depts & etc. The Planets Earth is a One Integral Unit and Fighting The Desertification should Occupy The Priority in our schedules as a part of our a Moral Responsibility towards The Planet Earth and Human Species as well as The Human Civilization. In briefly in order to be Human Civilization and Modern World we should have a Human and Modern Behaviors in our daily Schedules and Programs via giving The Priority to find a Suitable Solutions for Challenges which Threatening The Human Civilization and Life on Earth. Given the apparent success of BEAM, is it possible that additional inflatable modules will be added in the future? Seems like an extremely cost-effective method of expanding the habitat given the much lower launch costs in comparison to ‘hard’ segments. Why would you take all that lovely open space and fill in with storage units? Why not convert it into a recreational space for the crew? It is my understanding that it is not only the most spacious module up there but that it is also the quietest. It seems a shame to industrialise the only open space available. I guess it’s not surprising considering how open space is viewed as a opportunity to build something by industry on Earth. Edmund, have you seen a video tour of the ISS? Some areas are difficult for astronauts to negotiate because almost every square inch is taken up with stowed equipment and supplies. The sequential failure of resupply missions only reinforced the need to store even more supplies to help prevent the possibility the ISS would have to be abandoned due to lack of basic necessities.